Flamingos or flamingoes are wading birds that are most common in the Eastern Hemisphere, but also occur in the Western Hemisphere. 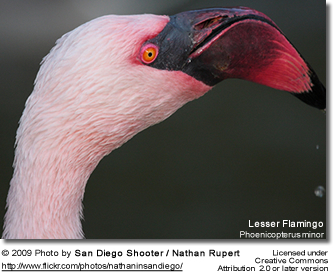 The name "Flamingo" was derioved from the latin word for flame, in reference to this species's flame-colored plumage. 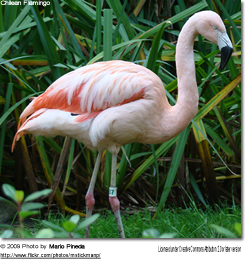 The flamingo's characteristic pink / salmon-colored plumage is a result of their beta carotene-rich diet. Environmental changes to their water habitat, such as toxic bacteria and environmental pollution, have caused the death of thousands of these birds and efforts are ongoing to protect them from further declines. There are four species in the Americas and two species in the Old World (Europa, Asia and Africa). Range: Occurs on the high Andean plateaus of Peru, Chile, Bolivia and Argentina. Range: Occurs on Caribbean and Galapagos islands. Range: Found in temperate southern South America. 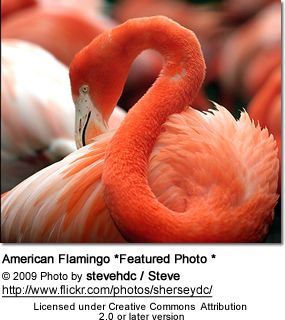 Range: Occurs in some areasof Africa, southern Europe and Southern and southwestern Asia, where this is the most widespread flamingo species. 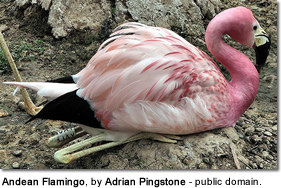 Range: Africa (such as Great Rift Valley) to northwestern India, where this species is the most numerous flamingo species. Flamingos are well known for their characteristic pink / salmon-colored plumage, which ranges from whitish, light pink to bright red due to aqueous bacteria and beta carotene obtained from their food supply. 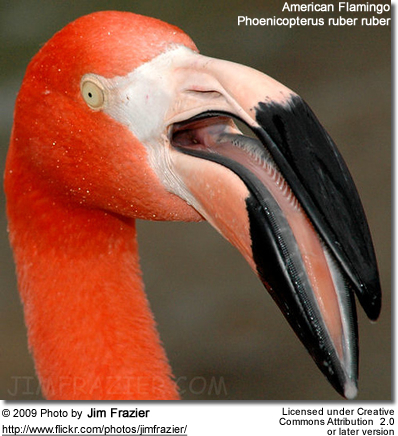 In the wild, a vibrant plumage is an indication of a well-fed flamingo, which increases their desirability as a mate. 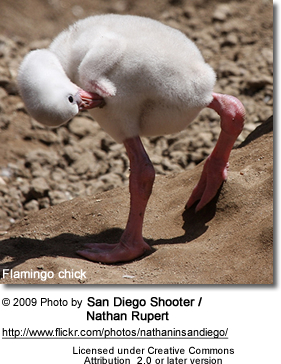 Pale or white flamingos are often undernourished and possibly unhealthy. This does not necessarily apply to captive flamingos. 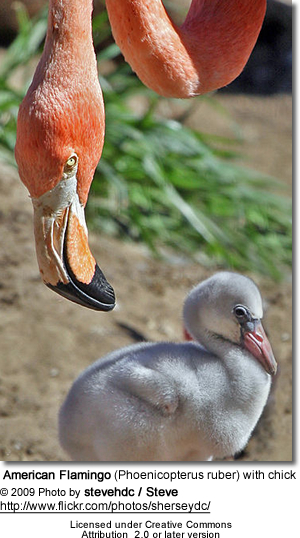 If they are not fed a diet rich in carotene, their plumage will not turn pinkish / salmon. 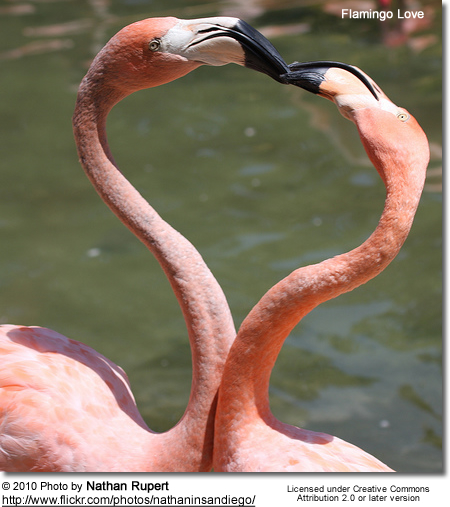 For this reason, some zoos add prawns and supplements (such as canthaxanthin) to the diets of their flamingos. 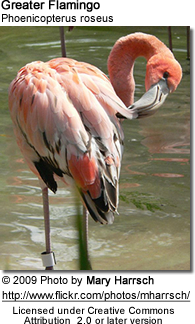 Flamingos usually stand on one leg, maybe to allow one leg to rest. However, the reason for it has not yet been determined. 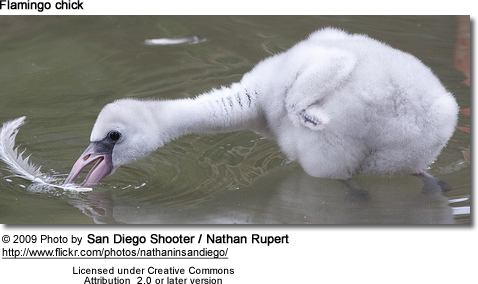 Depending on the species, newly hatched chicks have either grey or white down feathers. The red bill is straight and the plump legs are either red or pink in coloration. 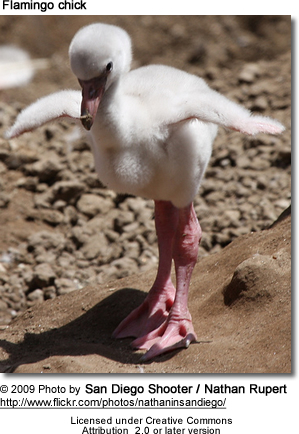 Young flamingos attain their full adult plumage when they are about 2 - 3 years old. Depending on the species, flamingos feed on brine shrimp or diatoms (blue-green algae) collected in shallow water through which they walk slowly with the bill dipped just below the water surface. Their specialized beaks separate mud and silt and the lamellae (miniature ridges inside the bills of water-feeding birds or "teeth") in the lower bill together with the large rough-surfaced tongue assist with the filtering of food. 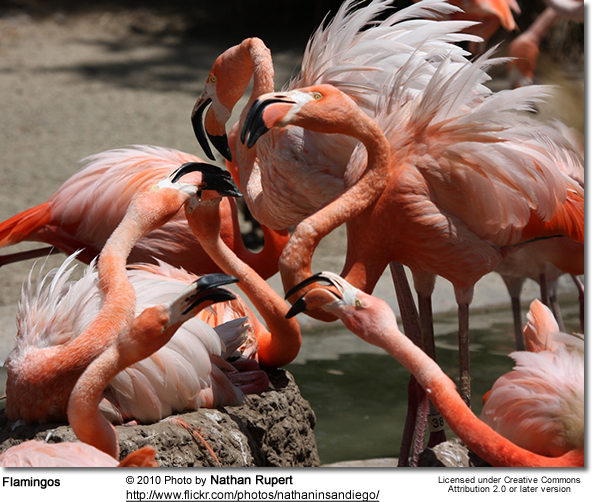 Flamingos nest in large colonies, often together with thousands of other pairs. Even though they are typically non-territorial, they will defend their nest during the breeding season. 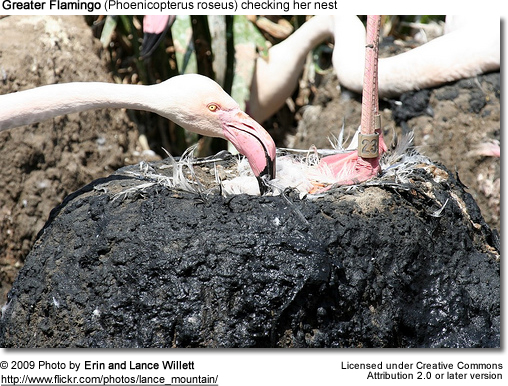 However, flamingos may not nest every year. Their nest is a mount made of mud and small stones, lined with feathers. It is often situated in shallow water. A nest mound may be as high as 30 cm (12 in); and It can take up to six weeks for a pair to complete the nest. The female only lays one chalky white egg. The parents share the incubation of this egg, which lasts about 26 - 31 days to hatching. For about two months, both parents feed the chicks with a substance called "crop milk" that contains various nutrients, such as fat and protein, as well as red and white blood cells. This milk is produced in glands lining the entire upper digestive tract (including the crop). 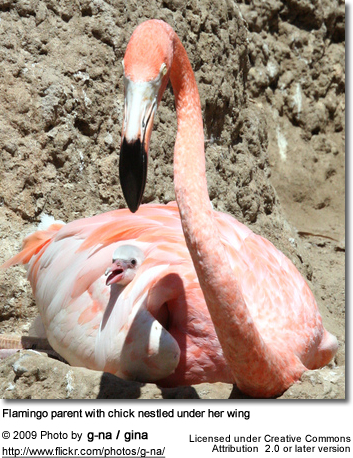 Depending on the species, other flamingos may act as foster feeders. Chicks usually leave the nest when they are about 4 to 7 days old, they will leave the nest; and often will gather together in creches that are watched over by a few adult birds. Parents will recognize their own young by their vocalizations, and they will only care for their own chicks. After about two months, their juveniles' bills should be developed enough to filter feed. Their calls are described as loud goose-like honking.